With its expanded living area, Chateau LeVeaux Condo #9 is a unique unit within the resort, located near the pool, hot tub, game room, and sauna. Chateau 9 is an extended lower level unit with 3 sleeping areas and one bathroom. The living room features a stone surround fireplace, futon one of the sleeping areas, and a flat screen TV. Enjoy incredible views from almost every room in this spacious lower level unit. Large windows in the extended sitting room area brings in the great Lake Superior views. Enjoy a cup of coffee in the sitting room area where you can enjoy watching the sunrise from the comfort of this temperature controlled room. The sitting room has a futon one of the sleeping areas and an A/C unit. Step out of the sliding glass door to the Chateau community areas. The kitchen was updated in 2018 and feature full sized stainless steel appliances. The galley style kitchen has a passway into the living room area. The is seating for four at the unique wood countertop. There is also a card table in the unit`s closet that provides more dining space. The bedroom looks out over the sitting room area and has a queen bed. The bedroom also has a flat screen TV with DISH. The bathroom was renovated in 2018 and has a walk-in shower. The bathroom also has a spacious bathroom vanity. 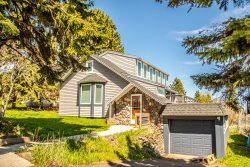 Enjoy access to Lake Superior`s shoreline, just steps from the unit. Chateau LeVeaux is a 34-unit vacation rental resort located on Lake Superior`s North Shore. The large lobby is a great meeting area for large groups renting multiple units. Enjoy your breakfast in the community lobby area. Complimentary coffee is available for you to enjoy in the mornings. The community deck has plenty of room for large groups to gather. Or just you and your loved one sipping coffee and enjoy the Lake Superior views. Enjoy an outdoor meal on the community deck. Take a dip in the heated indoor pool. The pool area also has a hot tub, sauna, and a game room, great for kids. On the grounds of the resort there are lots of places to grab a seat and enjoy the view. Or head down the stairs to the private lake front area. The lake front area in from of Chateau LeVeaux is ledge rock, great for sitting and watching the waves roll in. The gorgeous views looking up the shoreline. And don`t forget the views looking down the shoreline. The community fire pits are also a great place to gather and enjoy time with friends, family, and other Chateau guests. Map of Chateau LeVeaux property. Located in the east wing of Chateau LeVeaux Resort, this condo has been recently remodeled and expanded, making this a unique and roomy unit. More spacious than your other Great Lakes options, this condo has a beautiful sunroom with large windows facing the Lake. Cook breakfast in the full kitchen or relax by a fire in the wood burning fireplace. Living room features a wood-burning fireplace, futon and flat screen satellite TV. Glass sliding doors open for access to the patio with an awesome view of Lake Superior. You will also be able to enjoy the special amenities that Chateaux LeVeaux Resort offers, including a large deck with lake view, perfect for watching the sunrise or sunbathing, Lake Superior ledge rock shoreline, pool, hot tub, sauna, and game room. The resort is located on a quiet stretch of Highway 61 just a few short miles from many local North Shore attractions. Here you are just a short drive away from the beautiful Oberg Mountain Scenic Overlook and hiking trail, a must-see during leaf changing season. Head down the shore and check out Temperance River State Park or head up the shore and you will find Cascade River State Park - both great for hiking and enjoying some beautiful waterfalls. The Gitchi Gami Bike Trail goes right in front of the resort and runs along Highway 61. The trail is enjoyed by bikers and walkers alike, taking a scenic ride or stroll along Lake Superior's shoreline. The Lutsen Mountains recreation area is just 10 miles away and offers both winter and summer activities including skiing, the alpine slide, and a scenic gondola up to the Moose Mountain Summit. Enjoy the many restaurants and live music offered year-round on the mountain, as well. Pets are welcome with prior approval and an additional fee. 2 pet maximum. Holidays require a 3-night minimum stay on all Chateau LeVeaux properties. Super easy check in and check out! Great experience! Wonderful location on the water and close to beautiful hiking trails and the Lutsen mountains! The view was beautiful and so convenient to be so close to the game room and pool. We were out and about a lot seeing the sites and hiking, but the gentleman that was working is always very friendly and helpful. Loved our Unit #9. Very clean, comfortable, and nice decor. Very nice people, very friendly. We look forward to coming again and will definitely keep Chateau #9 as our option. Perfect location for the things we wanted to do, the room was just what we needed. Having that extra space for the second futon met our needs, as our boys need their space. We loved being on the ground level right outside the fire ring, we had several fires during our stay. The only negative was that the pool and hot tub heaters were not working properly, they were fixed on our last day there. But the boys had plenty of fun in the pool anyway. Perfect time with family. Thank you so much. Beautiful condo, clean, great view of the lake and very comfortable.